Thomas Edison's great-grandfather, John Edison, landed in what would one day become the state of New Jersey. This was in the 1730s and as a bit irony, 160 years later Thomas A. Edison would make his home not far from that original Edison homestead and farm..
During the Revolutionary War, John Edison remained a Loyalist and was imprisoned for those political views and if hadn't been for the efforts of some political influential family members, he might have been executed. At this time, the Edison family migrated to Nova Scotia and remained there until 1811, when they moved to Vienna, Ontario. When the War of 1812, Edison's grandfather, Captain Samuel Edison, served with the British in the War of 1812. 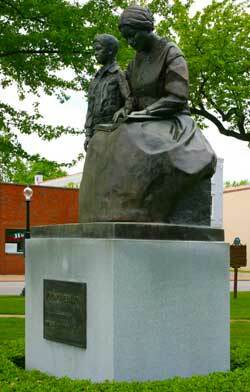 In Ontario, Edison's father met and married Nancy Elliott, a school teacher and daughter of Ebenezer Matthews Elliott, who been a captain in Washington's army. 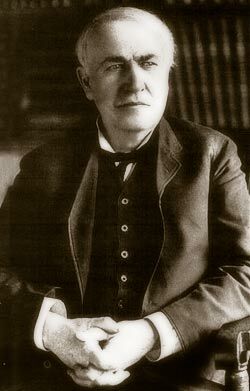 Samuel Edison became involved in a failed political struggle that forced the family to flee to the United States for their safety, where they settled in the town of Milan, where he decided to settle. Once they were settled in the small, but industrial center of Milan, Samuel established himself as a manufacturer of roof shingles. In 1847, over 900,000 bushels of wheat were shipped from Milan, making it the 2nd largest wheat-shipping port in the world after the Ukrainian city of Odessa. According to records, the lot on which the Edison's built their house was purchased in 1841 by Nancy Elliott Edison. Construction of the house began immediately but it would another 6 years before Thomas Edison would be born in the house on February 11, 1847. Seven years later Edison's parents sold the house and the family moved to Port Huron, Michigan. The birthplace was out of family ownership for the next 40 years. In 1894, Edison's sister, Marion Edison Page, bought the house and added a bathroom and other modern conveniences. Edison became the owner of his birthplace in 1906, and, on his last visit, in 1923, he was shocked to find his old home still lighted by lamps and candles! 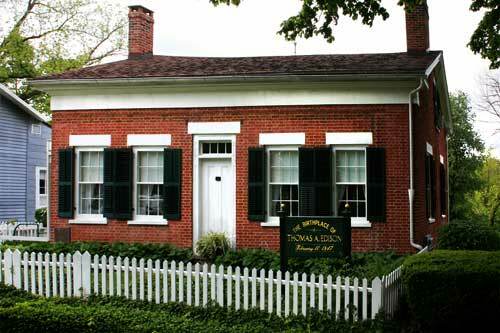 After Edison's death, Thomas' wife, Mina and their daughter, opened his birthplace to the public as a memorial and museum. The Edison Birthplace Museum, located next door, opened on the centennial of the inventor's birth in 1947.